A TV reporter is caught acting pretending the wind is so strong in Florence while two people in the background are casually walking by. Besides that, the wind is coming from behind him and he is acting as if he is fighting against the wind from the opposite direction. 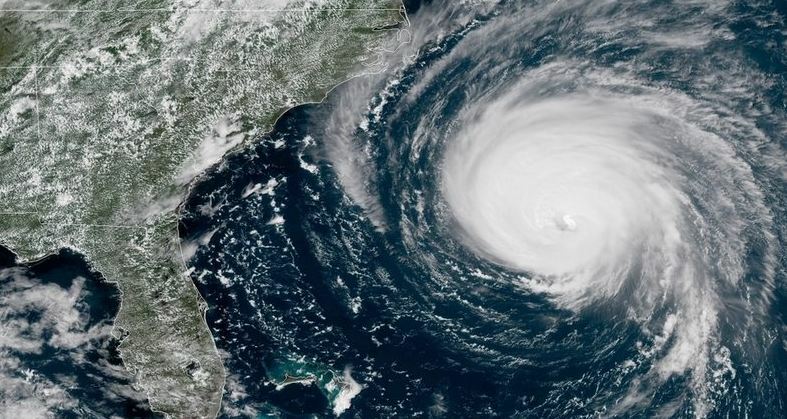 Hurricane Florence was downgraded to Category 1 before it made landfall. Instead of reporting the truth, the media seems desperate for attention and viewership that they are exaggerating and outright reporting propaganda. The media is so intent upon handing the country back to Democrats, there is not a single piece of news that they are now turning it against Trump claiming Global Warming is the reason for Florence. We can’t even just get honest weather reports without a political slant and manipulation. YET AGAIN, a massive hurricane feeding off unusually warm ocean water has the potential to stall over heavily populated areas, menacing millions of people. Last year Hurricane Harvey battered Houston. Now, Hurricane Florence threatens to drench already waterlogged swaths of the East Coast, including the nation’s capital. If the Category 4 hurricane does, indeed, hit the Carolinas this week, it will be the strongest storm on record to land so far north. President Trump issued several warnings on his Twitter feed Monday, counseling those in Florence’s projected path to prepare and listen to local officials. That was good advice. I grew up in New Jersey and had a family friend we called an uncle who lived on the beach. 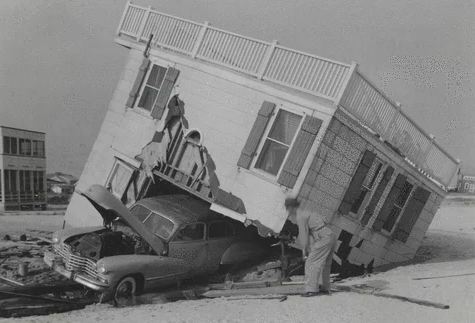 Twice he lost his house that was swept out to sea in 1955 and again in 1960. The press is acting like there have never been storms like we have today and this is all because of Global Warming. The first three of the top 12 worse storms to hit New Jersey took place in 1804, 1806, and 1821 followed by 1903. All predate the combustion engine and CO2 emissions. Then there was the famous Spanish Treasure Ship fleet where all 11 ships were sunk in a Hurricane of 1715. Hello! These are before they claim Global Warming began! The list of the worst storms from the 19th century forward is 1804, 1806, 1821, 1900, 1903, 1938, 1944, 1955, 1960, 1999, 2011, and 2012. The worst hurricane was 1900 insofar if the measurement is the number of people dead which reached 12,000 in Galveston, Texas. After the hurricane of 2017 that was to hit my area of Florida, CNN had people scared to the point they were, according to the Associated Press, paying $1,725 for a flight from Fort Myers to Charlotte, North Carolina ahead of Irma. People around here hate CNN for their coverage last year. They staged things like standing in water while the film crew was not anywhere close to the same depths. 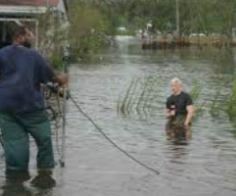 You have to figure Anderson Cooper was also probably standing with his knees bent to make it look even deeper. They are trying so hard to manufacture news it has become outrageous. CNN claimed there would be a storm surge of 7 to 10 feet. I live right on the beach and it reached maybe one foot. The other day, there were two young girls sitting at the next table and all they talked about was FAKE NEWS and how they will not even watch TV anymore. If they get caught manufacturing this nonsense, can we believe anything anyone says now in mainstream media left or right? The Hurricanes of 1933, 1936 and 1938 were devastating and did far more damage especially because they were successive. The weather was going really nuts at this point in history. 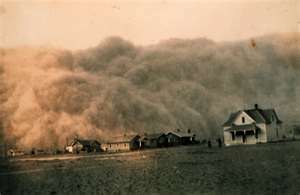 Don’t forget the Dust Bowl which wiped out agriculture and was the cause of protectionism as well as driving unemployment to 25%. This was one reason we had to collect data on such weather and include this in our models since it dramatically impacted the economy. At this point in time, agriculture during the Great Depression accounted for 40% of the civil workforce. When weather prevented crops, we plunged into the Great Depression. So what caused that? They must have a theory that we caused the hurricanes before the combustion engine? To watch what has become of the news these days is becoming really distasteful. They assume we are all just stupid and we will believe whatever they say about any subject. Congress really should restore the Fairness Doctrine and make it a crime to put out news stories that are just propaganda but expand it from broadcasting to print media as well. The Freedom of the Press has been converted into the freedom to manufacture news for the left and right. This entire FAKE NEWS trend is really absurd. Congress should restore the Fairness Doctrine and make it a crime for any reporter to distort the news for personal gain or political philosophy. Enough is enough!!!!!!!!!!!!!!!!!!!!!!!!!!!!!!!!!!!!!!!!!!!!!!! Of course, you will not find the press reporting that the polls show nobody trusts them anymore. They will never be caught writing a piece about themselves. The one thing that both Democrats and Republicans agree on is that the media can no longer be trusted. 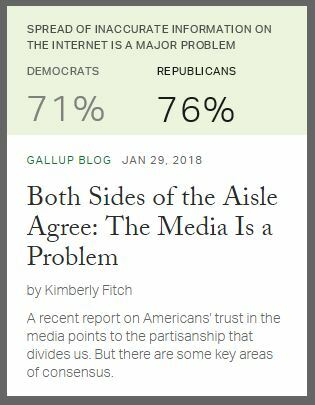 Both Democrats and Republicans agree that the media is a major problem according to Gallup Polls. It is time to DEMAND politicians legislate against this onslaught of constant manipulation by the press what everyone is now calling FAKE NEWS. In Britain, every newspaper and TV station was against BREXIT and they all had their polls which said it would lose. Our computer was correct in its forecast because it just looks at the economics and not “opinions” that seem to be skewed according to the sample they poll. When it comes to storms, they have falsely reported this stuff so much that when a real threat actually does present itself, nobody will listen. The media will be responsible for the deaths of countless people. I know myself, I will not leave my home when they claim the next hurricane is coming. With a power generator and a concrete house, I am fine.